Everybody knows that floor space in a garage is a premium. This video demonstrates how to take back some of that space by building a wall storage cabinet. You will discover some basic construction methods and the use of simplicity in gaining strength through the use of Kreg joinery. The goal is to bring together many components into one to look like one big cabinet. The reason there will be so many smaller components is because this is a do it yourself (DIY) project. One man, from start to finish, can handle the fabrication and installation of this large storage wall cabinet. The first of the components are ply-wood boxes. The sides of the units get drilled with a five millimeter drill bit or ¼” for shelf pins to support adjustable shelves. The second component is the face-frame. This will act as trim for the cupboard. It’s going to cover up the edges of the plywood and it’s also going to make it look like one box when it is finished. Face-frame cabinets are durable and strong because of this additional frame that gets attached to the front of the boxes. The third component parts will be simple plywood doors. Enough trim will be added to them to dress them up just a little bit. Since this is a one man project, the plywood needs to be cross cut to make it easier to handle. One of the safest ways to cut sheets with a skill saw is to support the sheets with several horses underneath. You want to ensure that when you complete the cuts, with your skill saw that the piece doesn’t drop causing pinching of the blade. 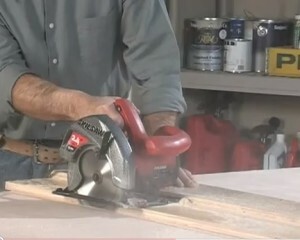 The video demonstrates the use of a home made guide that helps with the cuts. Take two pieces of plywood, both four feet (4′) long, one twelve inches (12″) wide, the other six inches (6″) wide and fasten them together. Then, run your skill saw along the fence edge so that it cuts the other part of the template off (refer to image). Once you have cross-cut all of your sheets, it’s time to move to the table saw to rip and cross-cut the upper wall cabinet tops, sides, shelves and bottoms. 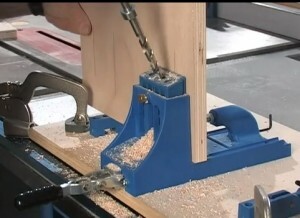 Clamp your Kreg jig to the worktable. You should begin with making alignment marks on the tops, bottoms and sides. The bottoms of wall cabinets should have at least four holes for the screws on each end. The sides should be spaced apart about eight to ten inches. You will also need to drill pilot holes in the hang-rails or back hanger struts. The sides of the cupboard will also need to have Kreg pilot holes drilled along the front edge for attaching the face-frame. After drilling for the cabinet assembly holes, you will need to drill for the adjustable shelf holes. Take a piece of hardwood like oak, maple or poplar and mark it for the adjustable shelf hole spacing. 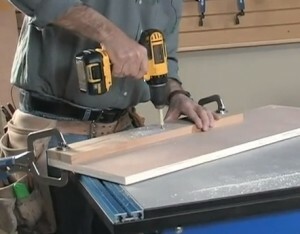 Using a five millimeter drill bit or ¼”, depending upon the size of your support pins, drill the holes in the side of the cabinets using the template. It’s important to be consistent with the end of the jig being in line with the top or bottom of the upper cabinet sides. With a vibrating sander, sand all of the parts really well. It is very difficult to sand in the corners after the cabinet is built. Assemble the cabinets by using a special clamp designed to be your helper. The clamp inserts into one of the Kreg holes to hold things tightly in place while you drive the screws. You only need to use common sense during this step to ensure that you assemble the parts correctly. When you fasten the top of the cabinet, you can have the Kreg jig holes facing outward. When you assemble the bottom of the upper storage cabinet, let the pilot holes be on the inside of the cupboard. This will allow the bottom of the cabinet to be nice and smooth. The next step involves cutting, drilling and assembling the face-frame. Two and a half inch (2-1/2″) wide stock will leave plenty of room to use two screws for each joint. The horizontal pieces of a face-frame are called rails and the vertical pieces are called stiles. The outer stiles should be cut to the overall height of the frame and the rails fit between them. Any additional styles will be cut shorter to fit between the top and bottom rail. Layout the face-frame and mark the pieces on the back of the frame where they will need to be clamped into the Kreg jig for drilling the pilot holes. Obviously, you want the better part of the material to be facing outward and the pilot holes will be drilled on the not-so-good side of the frame pieces. Assemble the pieces by adding yellow glue to the joints. Cut the doors by allowing for three quarters of an inch of molding to be added all the way around. Cut your molding pieces and glue and staple them to the wall storage cabinet plywood doors. Sand the doors so that everything is nice and flush. Paint the boxes, shelves, frame and doors. Allow sufficient time for them to dry. 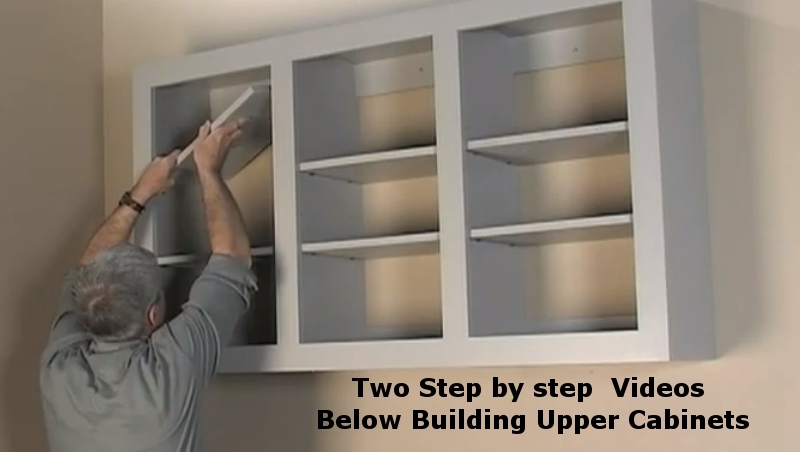 Install the upper storage cabinet boxes on the wall. You can draw a level line, locate the studs and support them with a temporary hanger cleat while screwing them fast. This is an excellent video demonstration on how to build an affordable upper cabinet for storage in the garage. There are many professional tips given in this clip on how to build an upper cabinet cheaply and yet maintain a high level of quality. The creator of this clip knows how to build cabinets properly.